A lot of people believe in Flat Earth Theory. Some may be surprised to learn that people still hold such views. After all, the Earth has been photographed from space. But such photos could have been faked by the evil forces who secretly control the world, right? And all those centuries of scientific evidence suggesting that the Earth is spherical could be wrong, right? In America interest in the flat-Earth movement appears to be growing. In September Bobby Ray Simmons Jr., a rapper also known as B.o.B, launched a crowd-funding campaign to send satellites into orbit to determine the Earth’s shape. On November 9th, 500 “flat-Earthers” assembled in North Carolina for the first annual Flat Earth International Conference. 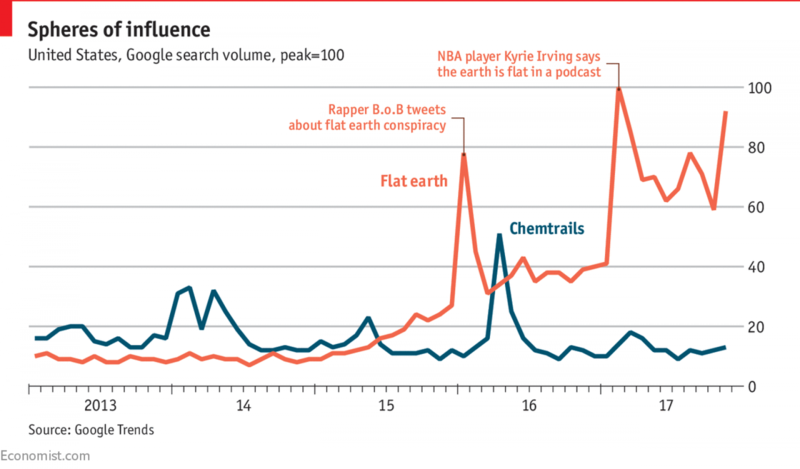 Data from Google Trends show that in the past two years, searches for “flat earth” have more than tripled (see chart). Conspiracy theories are not always harmless. The bogus notion that vaccines cause autism has led to a decline in immunization rates in some places, which has allowed outbreaks of measles. Skepticism about climate change has infiltrated schools. A recent survey found that a third of American science teachers tell their students that climate change is driven in part by natural causes. One in ten say humans play no role in it. Conspiracy theories are appealing because they offer simple explanations for complex phenomena, or because they let people believe they are in possession of secret knowledge that the powerful wish to suppress. They tend to be most popular among less-educated people who do not trust public institutions. They are extremely common in dictatorships, where people assume, often correctly, that the authorities are lying. Simply rebutting conspiracy theories may make adherents even more entrenched in their views. (If “they” are so keen to deny it, it must be true!) Absence of evidence is taken as evidence of a fiendishly effective cover-up. Some conspiracy theories are irrefutable—the American government cannot prove, for example, that it is not storing dead aliens in a secret underground laboratory. If schools were better at teaching analytical thinking, that might reduce the appeal of conspiracy theories and it would not hurt if governments were more open and trustworthy. Meanwhile, the best response is often to ignore the tinfoil-hat brigade.